(A) Electrical stimulation from a contemporary cochlear implant activates a broad population of auditory neurons due to current spread. 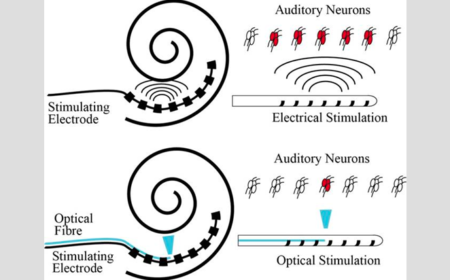 (B) Optical stimulation has the potential to activate a more restricted region of the neural population thereby delivering a more precise stimulus to the cochlea. Cochlear implants electrically stimulate the hearing nerve to enable people with hearing loss to effectively communicate with friends, family and colleagues. However, the resolution is poor (imagine a piano concert where one note of the piano activates your high- and low-pitch nerves at the same time!). The solution to this problem could be to use light to activate the hearing nerve as light can be focused for more precise activation. Researchers have discovered that neurons can be made responsive to light by the addition of a light-sensitive gene. But will this make a meaningful difference to the way people hear sound? The main aim of this project is to determine whether light stimulation alone or in combination with electrical stimulation can significantly improve the precision of nerve activation. This study will provide the key data required to develop a light-based cochlear implant with potentially hundreds of stimulating channels (compared to 22 in contemporary implants), thereby allowing recipients to experience more complex sound information. Innovative strategies to improve precision of cochlear implants could revolutionise the way recipients hear the world.